From the outside, The Big Chill House building looks spectacular, a floodlit white townhouse that puts the grimy environs of King's Cross to shame. The interior is equally shiny, with three floors of New York-ish glamour - lots of cosy nooks, low benches and a cream and grey colour scheme. Odd bits and pieces from the Big Chill Festival add a quirkiness that sets it apart from the run-of-the-mill style bars. It's also far enough away from Old Street that it has a certain identity of its own, attracting dedicated Big Chillers rather than passing trade. A comfy terrace adds to the summery vibe. The soundsystem is excellent and (as you'd expect from owners who started out running festivals) the music policy is entertainingly eclectic. The Big Chill House clubs, bars, cabaret nights, casinos and interesting nightlife. What are the best dining options near The Big Chill House London? The Big Chill House gyms, sporting activities, health & beauty and fitness. 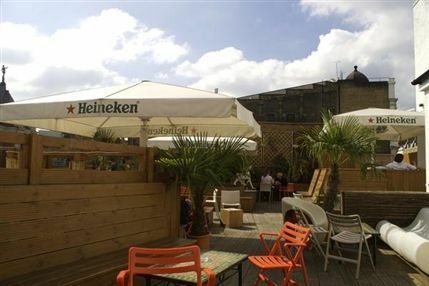 The best pubs near London The Big Chill House. Where to have your meeting, conference, exhibition, private dining or training course near The Big Chill House. From cheap budget hotels to luxury 5 star hotels see our special offers for The Big Chill House hotels, including Crowne Plaza Kings Cross from 86% off.